Independent consultancy and publisher SYPHA, has announced an all-new edition of The DAW Buyers Guide that can be accessed, free of charge, at http://SYPHAonline.com. The guide has undergone a complete update. Each of the more than 280 product entries has been renewed, and the search facilities have been improved. Sonic Studio LLC announced the availability of their first major software revision since taking over the Sonic Studio workstation products from Sonic Solutions. Sonic Studio HD version 1.9 is the culmination of over a year of development effort to fundamentally stabilize the workstation while boosting performance and adding long awaited functionality. Among the dozens of enhancements and additions to HD 1.9 are an entirely new mixing desk, revamped FFT tool, 16 channel I/O support on a single board system, and a dramatically improved and optimized DSP allocation system for desk events processing. 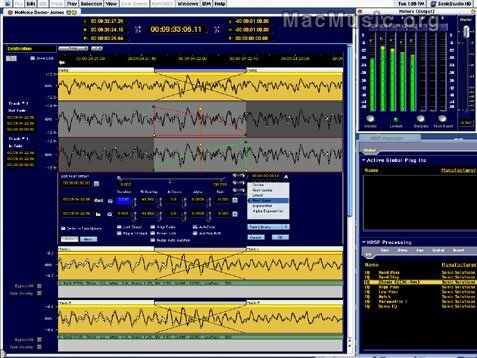 This version also resolves numerous longstanding issues with stability, synchronization, and CD imaging and is available to all Sonic Studio HD owners at no charge (Hey Digidesign...). 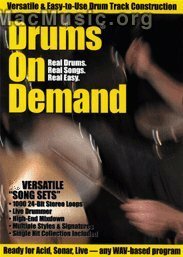 Drums on Demand Vol. 1 is now available in REX2 format, making the song-based drum loop CD even more functional in for Mac Users in Cubase, Reason, Logic, Digital Performer and other audio programs that support REX2 files. Bias has announced his new audio restoration plug-in for professionals at AES in NY. Rather than splitting the restoration process into separate plug-ins, SoundSoap Pro uses a unique, integrated interface that allows the user to access any tool quickly and easily from within a single plug-in window. Tool navigation tabs are labeled (left to right) "Hum & Rumble," "Click & Crackle," "Broadband," and "Noise Gate" - reflecting the suggested order in which the operations should be performed, to obtain the best possible results. The tabs even provide convenient parameter feedback, allowing the user to monitor the primary tool settings globally, regardless of which tool is currently selected. 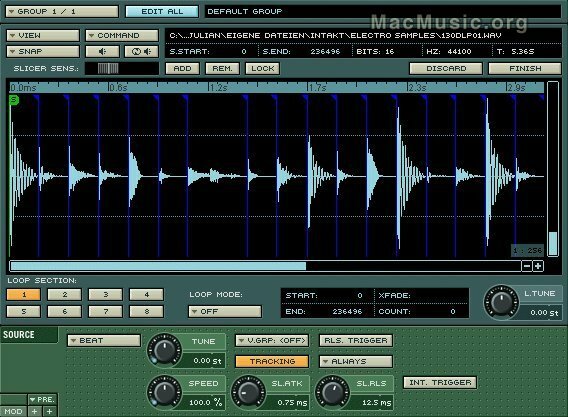 In the second half of October 2003 the Native Instruments sampler KONTAKT will receive an extensive update to version 1.5. KONTAKT 1.5 brings many new and improved features, including a Beat Machine for slicing and syncing loops, the excellent Time Machine II, VST automation and much more. In addition KONTAKT 1.5 provides Mac OS X compatibility and new interfaces, namely Audio Units and RTAS. Details on the update Post a comment ?